On October 10, 2014, Pakistani alumna and social activist Sana Ejaz organized an interactive classroom discussion on human rights to raise awareness about gender-based discrimination in Pakistan. The discussion engaged 35 young students, both male and female, in Khyber Pakhtunkhwa Province to untangle misunderstandings about gender discrimination. Sana Ejaz’s participation in the Pakistani Educational Leadership Institute Program (PELI) allowed her to apply the teaching methods she learned in the United States to directly engage students in Pakistan on issues of social justice through creative means. The PELI program, established in 2004, is a month-long program funded by the U.S. Department of State at Plymouth State University in New Hampshire. The program exposes Pakistani educators to the U.S. educational system, allows them to share best practices, and inspires change and improvement in the quality of teaching and education in Pakistan. As a social activist and advocate for women’s rights, Sana utilized the classroom as a forum to empower youth in Khyber Pakhtunkhwa to tackle social issues. Sana facilitated dialogue among the students to understand gender rights as a facet of human rights, imploring them to re-assess their assumptions about gender discrimination. 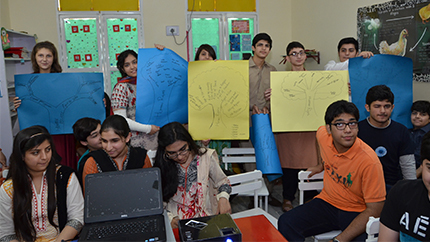 Then by relating their own experiences to the realities of gender discrimination in Pakistan, the students developed “human rights trees” depicting what rights they thought to be necessary for the sustainment of prosperous communities. Sana’s classroom program in Khyber Pakhtunkhwa thus not only allowed youth to cultivate their critical thinking capabilities but also to shatter misunderstandings of gender discrimination in Pakistan.